Chapter 1. What Does the Research Say About Vocabulary? One of the key indicators of students' success in school, on standardized tests, and indeed, in life, is their vocabulary. The reason for this is simply that the knowledge anyone has about a topic is based on the vocabulary of that information (Marzano & Pickering, 2005). For instance, as you read the following sentence, see if you are able to determine what is being discussed. A duct-less split can produce the exact amount of energy needed to temper an envelope. When I first read this sentence, my mind started to try to make connections to envelopes and wondered if tempering had something to do with getting or keeping the glue on the flap. If you are an engineer, you probably know that the sentence above refers to equipment and its capability of cooling a room. As with any topic, the more you know about heating and cooling, the easier it is to learn and understand information about it. There are a variety of factors that affect student achievement, including the effectiveness of the teacher, the student's own personal interest in the content matter, and the amount of information students already possess about the content. "Prior knowledge" is a term with which most educators are familiar. In neuroscience terms, we are talking about long-term memory. And, yes, prior knowledge, also known as background knowledge, consists of networks in the brain that have been placed in permanent memory. In this chapter we will consider how students obtain knowledge about subject matter and how vocabulary supports this knowledge. According to Marzano (2004), background knowledge is acquired through the interaction of two factors: the ability of the student to process and store information (which will be covered in Chapter 2), and the regularity with which a student has academically oriented experiences. Professional educators know that the amount of background knowledge our students have may rely a great deal on their cultural differences and their economic status (Tileston & Darling, 2008). Not only does background knowledge grow in the brains of our students through their experiences, but the vocabulary words that are stored as a result of such experiences provide avenues to comprehend the curriculum from the text, as well as lecture and discussion. We can look at the work of Piaget (1970), who concluded that we organize information in our brains in the form of a schema, a representation of concepts, ideas, and actions that are related. Schemata (the plural of schema) are formed in our brains through repeated and varied experiences related to a topic. As a neuroeducator, one who teaches students and teachers based on current brain research, I like to refer to schemata as those networks in the brain that we form, store, re-form, and restore through our interactions in the world through both experience and environment. It is the brain's ability to change known as neuroplasticity that allows us to learn and form lasting memories. (Doidge, 2007). Yet, as new evidence presents itself, the brain can change to accommodate the new information. Often long-term memory is compared to files in our brains. Just as you store files on your computer or tablet, the brain stores information in ways that allow it to retrieve concepts, ideas, and actions in an orderly and expeditious manner. Consider, if you will, the file you have stored for "school." As an educator, you may have stored in that file what you liked or loved about school that brought you to the classroom and perhaps beyond. In that file you may also have memories of your own school days, beginning with preschool and going through the university degrees you may have. Certain teachers who are role models for you are stored in this file, as are teachers you would not want to emulate. If you have been in education for a while, there are many "buzzwords" that have been used throughout the years that were considered best practices in teaching. Today you have probably added terms like differentiation, Response-to-Intervention, and Common Core State Standards. All of this, and much more, refers to your background knowledge of "school." All of our students have a school file (or schema) in their brains as well. Their files are likely very unique to their experiences with schools and teachers, their cultures, their parents views of education, and their personal success in school. It is no easy task to build background knowledge in students who enter our classrooms with few academic experiences from other classrooms or from real-world involvement. Background knowledge is a reflection of who they are; it is the lens through which they see the world. Those students from low-income families see school in a different light. School may be a place to be safe when home is not. School may be inconsequential to those who believe their "street smarts" will get them farther in life than school smarts. School may feel dangerous to some students whose parents identify school as a place where they felt stupid or unappreciated. Many students from impoverished backgrounds enter school with little knowledge of a world outside the streets where they live. If their poverty was pervasive throughout their short lives, factors such as lack of nutrition or exposure to toxins may have stunted the growth of their brains, which affects their cognitive abilities (Perry, 2001). According to educational research by Hart and Risley (1995), children enter school with "meaningful differences." The differences that did not appear to be meaningful were things like race, ethnicity, birth order, or gender. What made a big difference among students was economics. In their book, Meaningful Differences in the Everyday Experiences of Young American Children (1995), Hart and Risley state, "by age 3 the children in professional families would have heard more than 30 million words, the children in working class families 20 million, and the children in welfare families 10 million" (p. 132). Interestingly, although the number of words spoken was different, the topics and the style of speech were similar. The parents who spoke to their children more began to ask questions, vary their vocabulary, and in general offered the kids a rich language experience. In addition to counting the number of words that were spoken to the children, Hart and Risley also examined the types of reinforcement the children received. The number of affirmative statements as opposed to prohibitory statements was tallied for each socioeconomic group. The professional parents offered affirmative feedback much more often (every other minute) than the other groups. The welfare parents gave their children more than twice as many prohibitions as the professional parents. Some children in professional families heard 450 different words and 210 questions in the three hours the parent spoke most. Another child from a low-income family heard fewer than 200 different words and 38 questions in that same amount of time. The results of the study lead all to believe that the single-most important component of child care is the amount of talking occurring between child and caregiver. Vocabulary is a strong indicator of student success (Baker, Simmons, & Kame'enui, 1997). Printed school English, as represented by materials in grades 3 to 9, contains 88,533 distinct word families (Nagy & Anderson, 1984). 88,533 word families result in total volumes of nearly 500,000 graphically distinct word types, including proper names. Roughly half of 500,000 words occur once or less in a billion words of text (Nagy & Anderson, 1984). In grades 3 through 12, an average student is likely to learn approximately 3,000 new vocabulary words each year, if he or she reads between 500,000 and a million running words of text a school year (Nagy & Anderson, 1984). Between grades 1 and 3, it is expected that economically disadvantaged students' vocabularies increase by about 3,000 words per year, while middle-class students' vocabularies increase by about 5,000 words per year. Children's vocabulary size approximately doubles between grades 3 and 7. More recent research added pertinent information to vocabulary development. Dr. Catherine Tamis-LeMonda of New York University and Dr. Marc Borstein of the National Institutes of Health approached the topic of vocabulary development in a different way. They compared maternal responsiveness in children who all came from professional families, with interesting results. (Remember that the children from professional families heard 30 million words by age 3.) The study found that the average child spoke his or her first words by 13 months and by 18 months had a vocabulary of about 50 words. Mothers who were considered high responders—that is, they responded to their child's speech quickly and often—had children who were clearly 6 months ahead of the children whose mothers were low responders. These toddlers spoke their first words at 10 months and had high vocabularies and the ability to speak in short sentences by 14 months (Bronson & Merryman, 2009). A desire for reliable relationships. Much research looks at the teacher-student relationship as a driving force for motivation, socialization, and academic performance. A desire for social acceptance by peers. In order for students to seek academic achievement, it must be socially acceptable to achieve it. Your school must create a culture that supports and encourages good academic behavior. A desire for social status. Students want to feel special. The emotional brain contains an affective filter that will allow information to go to higher levels of thinking under the right conditions. Negative feelings, lack of social status, and low peer acceptance will keep the brain focused on these and prevent cognitive function. How Are the Brains of Poor Kids Different? The executive system, which engages the prefrontal cortex of the brain. This structure is crucial to working memory, future planning, delaying gratification, and decision making. The language system, which involves the temporal and frontal lobes of the left hemisphere. This system is our reading system and contains the structures that allow students to decode, pronounce, and comprehend. The memory system, which allows students to process semantic learning (text, lecture, pictures, etc.) and then store it. This system is responsible for one-trial learning and the ability to retain a representation of a stimulus after a single exposure to it. Our emotional center and our memory center are next to each other, which explains why emotions influence our memories. The cognitive system, which includes our visual spatial abilities and our problem-solving capabilities of the parietal lobe. This system is vital to sequencing, organizing, and visualizing. The visual cognitive system, which allows students to recognize patterns, remember images, and abstract information. The results of testing these systems in several studies remained fairly constant. The lower the socioeconomic status, the more difficulty the students had performing tasks involving these systems. Most noticeable were the memory system issues and the language system issues. The group tested middle school students and primary students with the same results. These issues affect not only school performance, but life performance as well. As researchers continue to study the effects of poverty on academic performance, they know there are a myriad of possible causes of these issues. It is not the purpose of this book to delve into those causes. I will suggest that most research examines prenatal toxins, maternal stress, lack of proper nutrition, living in toxic areas, maternal education, and the amount of language and literacy in the home. Because the brain is malleable and these systems can change, researchers have made several suggestions to improve the brain systems of low-SES children. Gazzaniga, Asbury, and Rich (2008) suggest the arts can improve cognitive skills, processing, attention, and sequencing. Pereira and colleagues (2007) suggest physical activity as an avenue to produce new brain cells, which has been associated with increasing learning and memory. Computer instruction in which students identify, count, and remember objects by holding them in working memory can increase working memory within a matter of weeks, according to Klingberg and colleagues (2005). Training in music can improve the brain's operating systems as it enhances focused attention, which will assist in memory (Jonides, 2008). The arts, movement, computer use, and music are some of the strategies that will be helpful in teaching all of our students the vocabulary of the standards. Understanding and being aware of some of the challenges that our at-risk students face will help us to focus our vocabulary teaching in a way that will improve the minds and memories of our students. Tier 3 consists of words whose practical use and frequency is low. These words are domain-specific and are used for brief periods of time when we are studying particular content. Tier 3 words are central to building knowledge and conceptual understanding within the various academic domains and should be integral to instruction of content. Medical, legal, biology and mathematics terms are all examples of these words. Although useful while covering specific topics, these are too specific to be included in the most useful tier for vocabulary building, Tier 2. 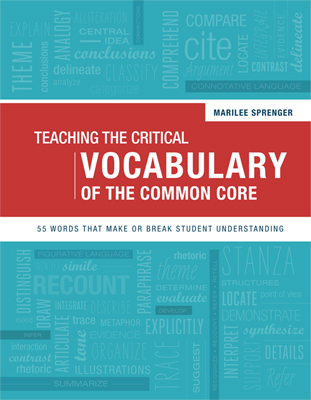 The CCSS stress that learning and using vocabulary is an essential component to college and career readiness, and references to it appear throughout the grade-level standards. How do students add words to their mental lexicon? It begins with listening to the conversations in the early environment. Then vocabulary would be enhanced through listening to adults read aloud. Because stories contain vocabulary words not used in daily conversation, this is an excellent way to expand vocabulary. Students who come to our schools from a literacy-rich home are clearly in a better position to meet the CCSS. But the neuroplasticity of the brain teaches us that all students can learn, enhance their vocabulary, and change their brains (Sprenger, 2005). Begin with a story or explanation of the term. Modeling how you use the word in your life or in conversation may be helpful to students. Have students put information into their own words. This process, which I call "recoding," is necessary to make sure students understand the word. This is a vital step in the memory process. Skipping this step can be disastrous as students may have a misconception that will be placed in long-term memory through incorrect rehearsals (Sprenger, 2005). Ask students to draw a picture or a graphic representation of the word. According to Ruby Payne (2009), if students cannot draw it, they really don't know it. Provide several engagements with the term and have students write them in a notebook. Research suggests that writing is good for the brain and memory, so using those notebooks or some other platform for writing is important (Snowdon, 2001). Informal rehearsals are just as important as formal ones. Engage students casually in conversation using the term. Putting them in pairs and letting them discuss their definitions is a good way to see if all students are storing the same information. Play games with the words. Games are a brain-compatible strategy for reinforcing learning. Actively processing vocabulary words in multiple ways allows the brain to store information in multiple memory systems, thus making access to that information easier with multiple triggers or cues (Sprenger, 2010). Why Worry About the Critical Words? According to the neuroscientific research, my suggestion that it is "now or never" doesn't make much sense. But as a classroom teacher, I can tell you—and indeed, you can tell me—how important it is to get kids up to speed as quickly and efficiently as possible. Sure, anyone can learn the 55 or so words I consider critical to test taking, academics, and to life. But we should teach these words sooner rather than later to help our students increase test scores, build confidence, and put the words into daily use. Vocabulary has long been ignored or thought a burden in our classrooms. It is time to give it the time it deserves. Teaching vocabulary in fun and interesting ways will make learning new words something for all of us to look forward to.